Hi Everyone! It's Ashley here on the blog today. 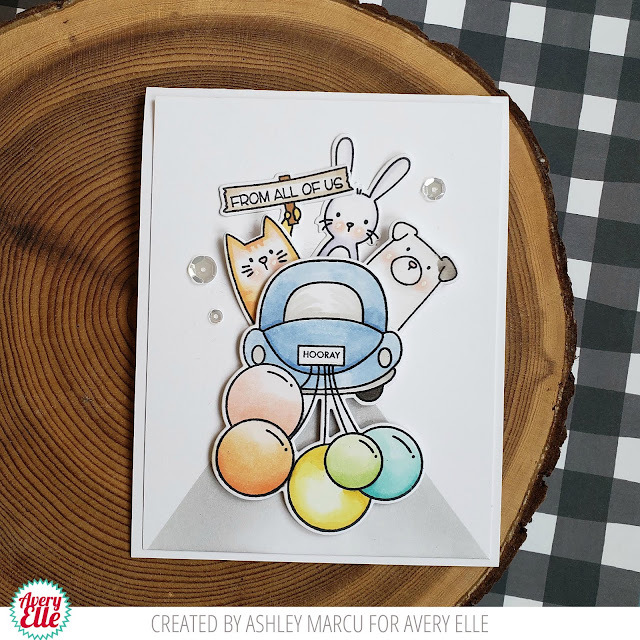 I'm sharing the You've Got This stamp set today. The sentiments in this set are so thoughtful and perfect for so many occasions. Let me show you what I made. I started my card with the water colored background. These are all colors from Avery Elle's amazing liquid water color line. Next I die cut, then stamped the large sentiment. I adhered the pieces together and then added the small sentiment. How perfect do those little letters stamp? I love it! This is such a simple card but I love how it turn out. Hello! 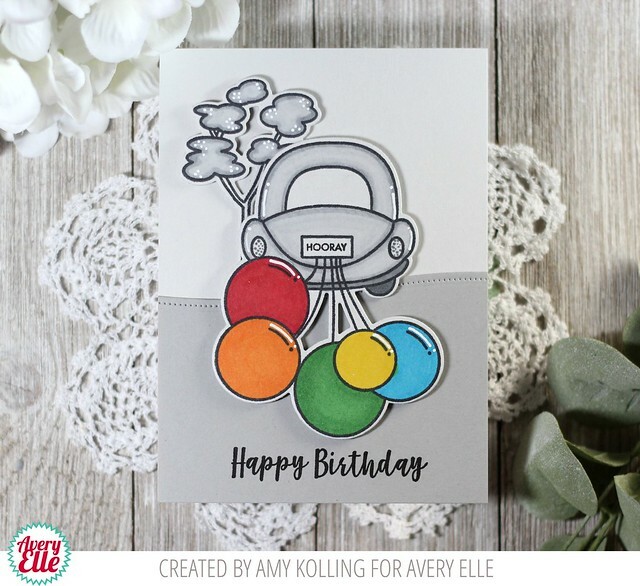 Amy here with a card using a small stamp set called You've Got This. It has one large sentiment with many small supporting sentiments that can be used for many difficult occasions where you just don't know what to say. I started with the Quilted Frame Die done in white cardstock. Since this frame has an opening in the center, Broken China Distress Ink was blended in the center. After adhering the frame, I began working on some older but gorgeous blooms from Floral Bouquet. I white heat embossed the blooms using Pure White Fine Embossing Powder and used the Emboss Resist technique to add color with Distress Inks Worn Lipstick, Broken China, and Squeezed Lemonade/Mustard Seed. All the images were die cut using the Floral Bouquet Elle-ments and adhered to the notecard with foam adhesive. The sentiment takes center stage when done in black with the layering die cut done in white. This was added across the panel and a white heat embossed sentiment strip was added over the top with foam adhesive. A few white gems were added to finish the card. Hi Everyone! 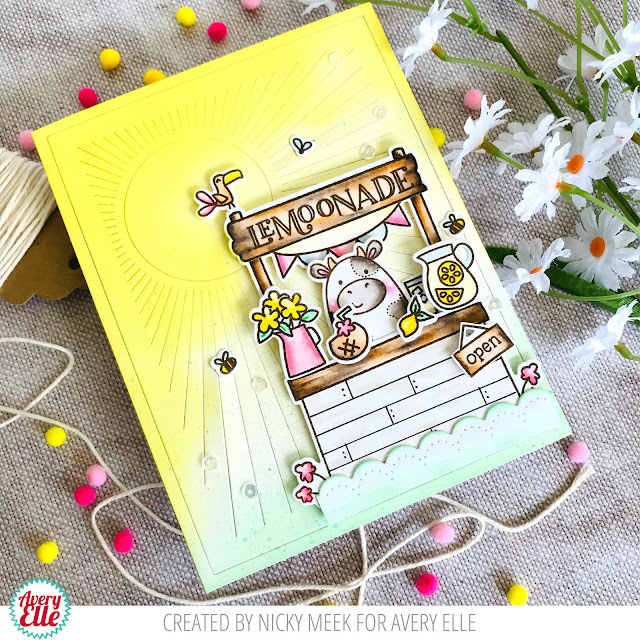 I am popping in this week with a super cute card to share with you. Check it out. Hey there, I'm over on the Avery Elle Blog today with a card featuring a fabulous little set called You've Got This. 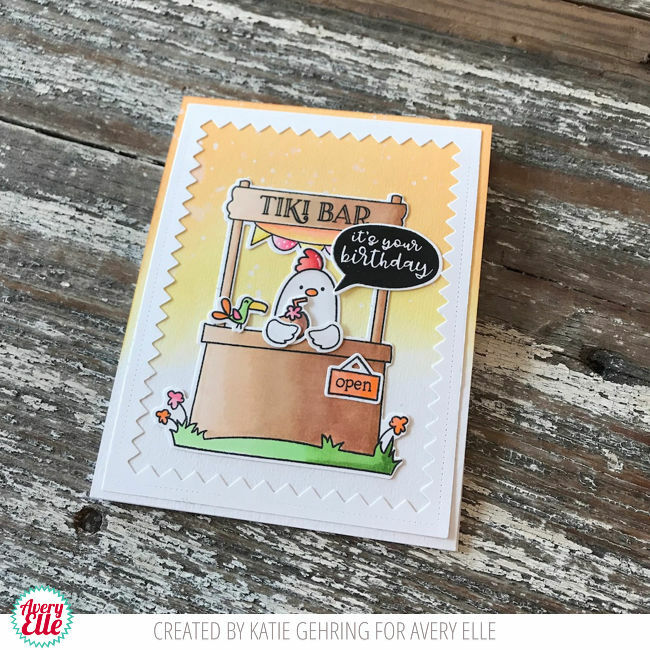 It has a gorgeous feature sentiment that also has a two-layered accompanying die and then lots of great encouraging extra sentiments for lots of different (and difficult) occasions. I started with a white card base and blended some Lemon Grass and Sea Glass inks to give a little colour to the background. I then took some aqua coloured cardstock and made a panel using the Embellished Heart die to make an aperture. I wrapped some Midnight Twine around the panel then popped it on the card front using foam tape. I finished off the card by die-cutting the two layers of the sentiment in black and white card and adhered it across the heart aperture. Hi Everyone! Ashley here today! 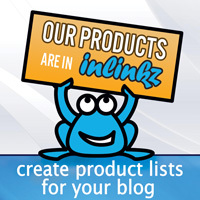 I'm looking forward to sharing Market Stand with you! 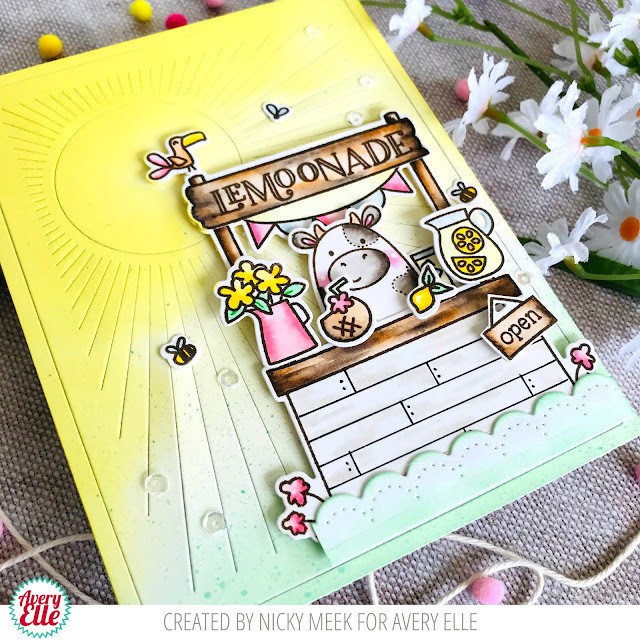 I was SO excited to create with this stamp set! Let's get started! This card was SO much fun to create! I started by stamping, die cutting and coloring all of the pieces for my scene. I used Market Stand, Llamazing and Peek a Boo Pets. Next, I water colored the background. Finally, I adhered all of the pieces in to place! I love how Market Stand can take on so many looks. Check out this card I made a few weeks ago HERE for a completely different look. I can't get enough of this stamp set and I know you will enjoy it too! 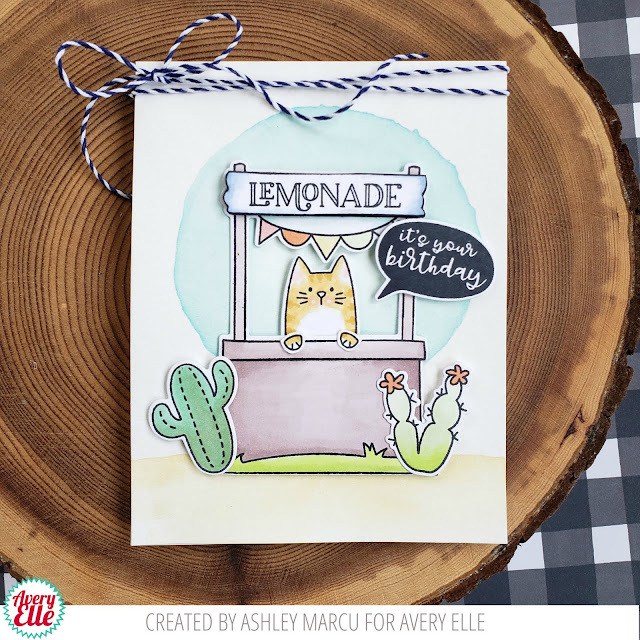 Katie here with a fun card to share today featuring the Market Stand stamp set. I just love the Market Stand stamp set. It features so many great images and accessories that make it truly versatile; plus it pairs so well with the all the adorable Peek-a-Boo animal sets. I stamped the images with Avery Elle's dye ink and colored them with Copic Markers. I die cut the images using the coordinating dies and arranged them on a panel that I colored using two shades of Distress Oxide inks (Dried Marigold, Squeezed Lemonade). 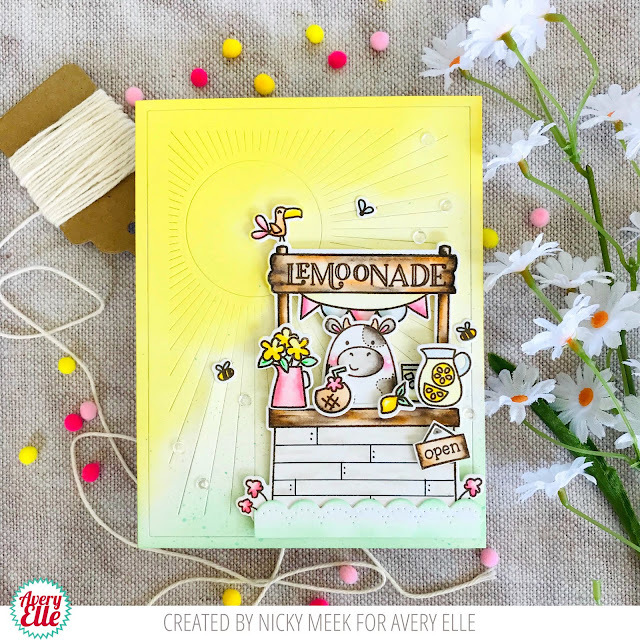 I framed the scene using the Reverse Pinked Elle-ments dies, which happens to be on sale right now in the Avery Elle store! A speech bubble from the Peek-a-Boo Pets stamp set finishes off the card. 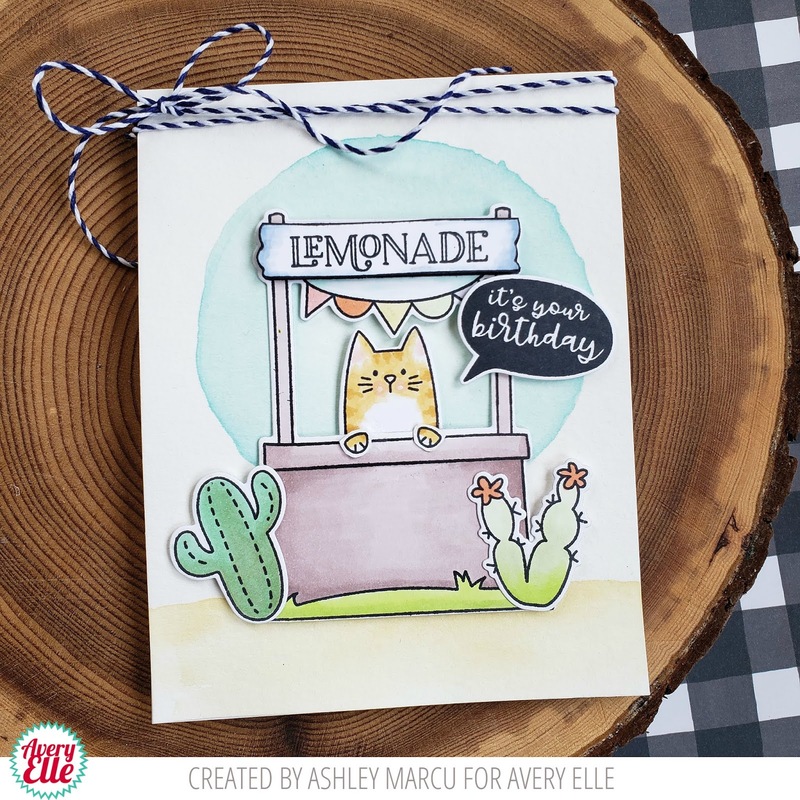 Elena here, with a card combining images from both Market Stand and Peek-A-Boo Pets. I can't get enough of these 2 sets together! I couldn't decide which critter I would want a hug from, so I crammed 3 of them in there. ha. 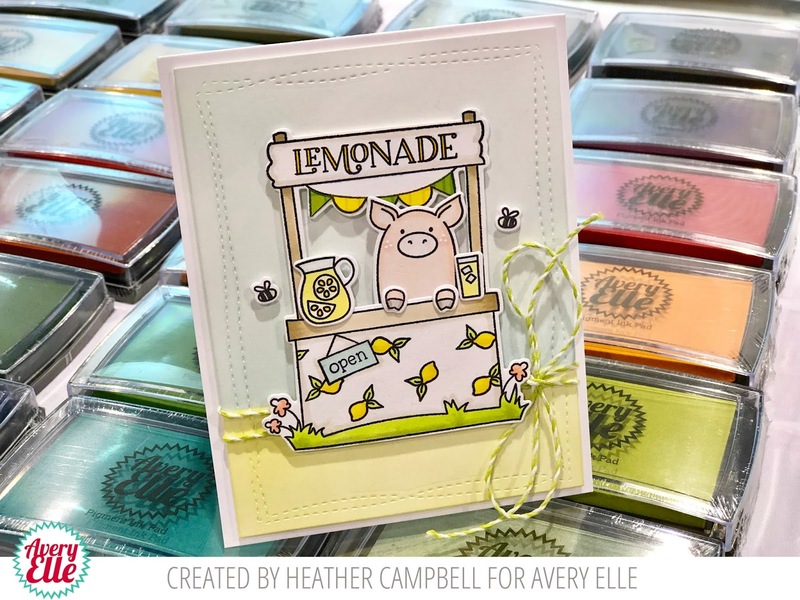 I stamped, and die-cut all of my images (Market Stand dies and Peek-A-Boo Pets dies) and then colored everything using copic markers. I've had a few die misshaps in the past, where my die shifted in the machine, so I always color after I've die-cut. Isn't it so cute how you can change the personality of these critters by how you decide to position their hands? (paws, hooves, whatever.) The cow with his one hoof slung around the pole of the stand... so cute! 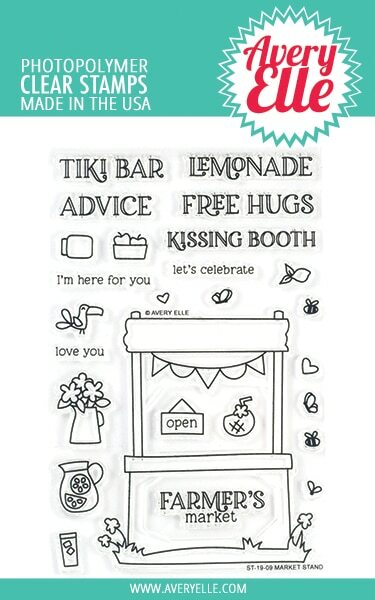 I just love the sheep peeking up from the top of the "free hugs" stand! I hope you like it too! Thanks for stopping by! Hello! 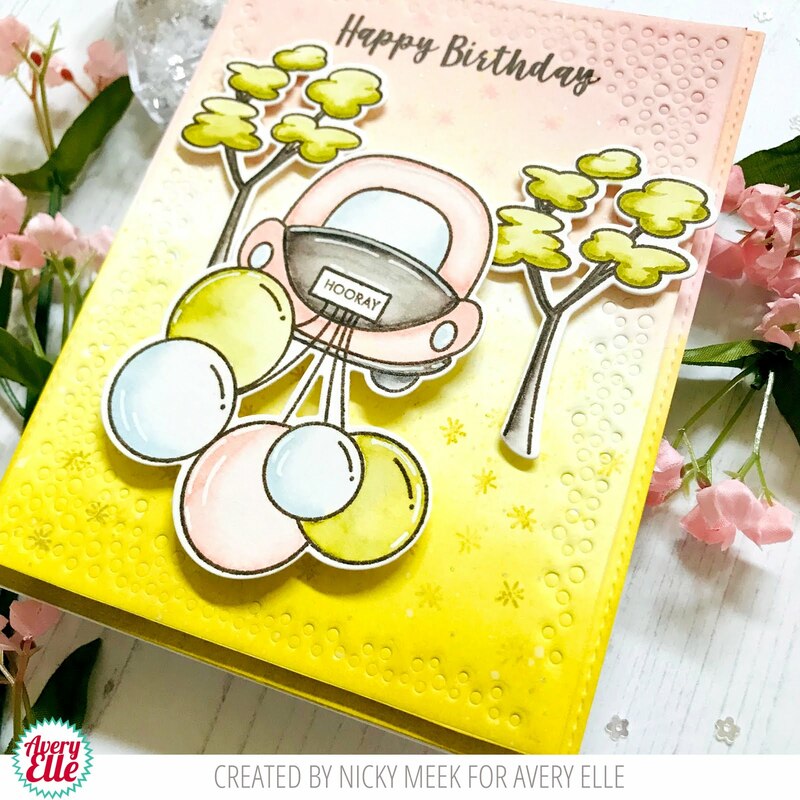 This is Nicky back with you today and I'm sharing a card made using Market Stand which comes with coordinating Elle-ments. I also used the new Ray Die for my background panel. Tucked into the scene is the cow from Peek-A-Boo Pets. I also converted the word LEMONADE into LEMOONADE because I can never resist a good pun! To make this card I ink blended a panel of cardstock using Distress Oxides in Squeezed Lemonade and Cracked Pistachio. I then squished a little of the Cracked Pistachio onto my craft mat, spritzed some water next to it and using an old toothbrush I mixed the solution picking it up on the brush and then splattered it onto the panel softly blending some of the green into the yellow. I then die cut the panel using the Ray die and I put the pieces back together on the reverse with tape and secured it to my card base. I stamped my images from Market Stand and Peek-A-Boo Pets onto Bristol Smooth cardstock and it was at this point that I masked the word LEMONADE to convert it to the punny LEMOONADE. Images were die cut using the Elle-ments that coordinate and then I watercolour painted everything using Kuretake Zigs in the following colours - Yellow 050, Haze Blue 302, Green Shadow 049, Pale Yellow 055, Beige 072, Light Pink 026, Warm Gray(2) 900 and Mid Gray 096. You can decorate the front of your farm stand however you like but I chose to draw in a whitewashed boards look! All images were adhered to the scene using dimensional foam tape. My final touch was to add a few sparkling clear sequins as a final embellishment. 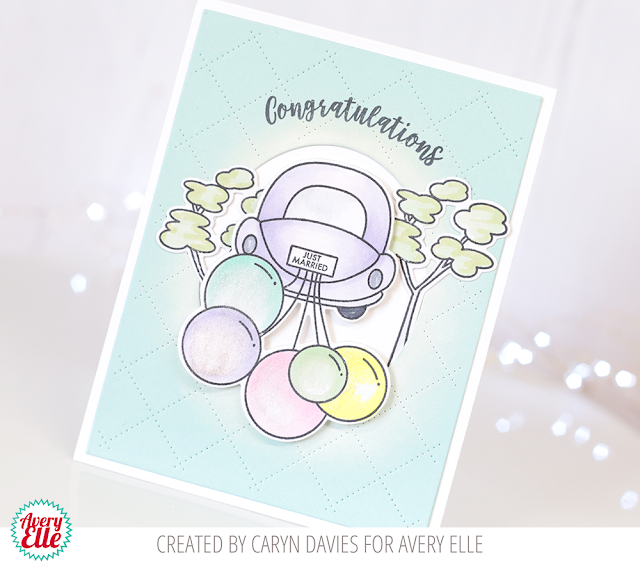 This summery card could be used for all number of occasions especially with a sentiment stamped inside. 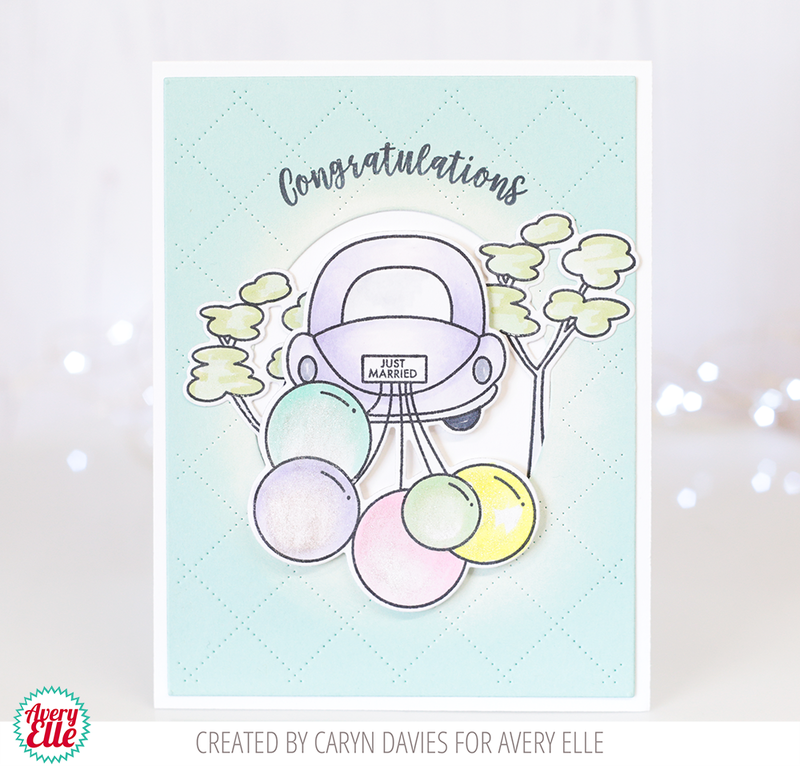 Thank you for stopping by the blog today to read about my card, see you next time! Hello! I am popping in to share this card that I created with you today. I hope that you enjoy it! Hi Everyone! Ashley here today! 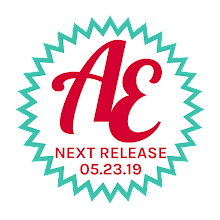 I'm sharing Journey and a few other fun Avery Elle favorites! I started this card with the large car and balloon stamp from Journey. I colored it with Copics and added the "hooray" sentiment to the license plate. I love adding little details! 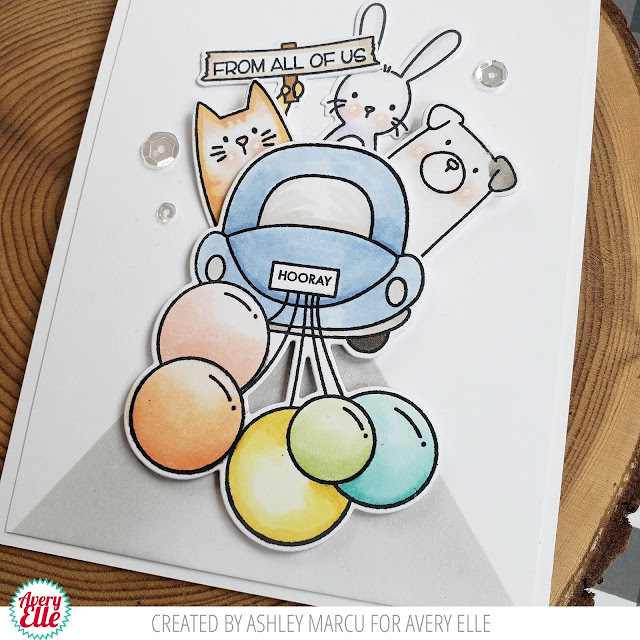 Next I stamped a few of my favorite animals from Peek a Boo Pets and a Peek a Boo Pal. Finally I stamped a sign from All of Us. I love that I can use this card for several types of occasions. It can be a birthday card, congratulations or graduation. All I need to do is add a sentiment inside once I know where it's going and it will be ready! Hey there, Caryn here today with a pretty pastel card using the fabulous Journey stamp set and dies. I've paired it with an awesome new coverplate die called Quilted Frame. I love the way it looks with a little white pigment ink blended around the aperture - it gives the scene a pretty, whimsical feel. Once I assembled the pieces in place with foam tape I stamped the sentiment on a curve and added "Just Married" to the number plate. Love how this set can be used for so many occasions just by changing the the sentiments that are included. Hello! 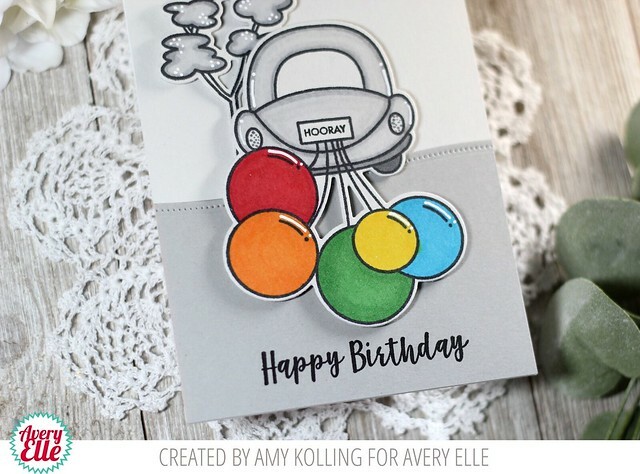 Amy here sharing a fun and unique take on a birthday card! I am all about COLOR on cards but I thought I'd try something a bit different. I decided on making my card out of all shades of GRAY....everything from the Copic coloring to the background card stock. 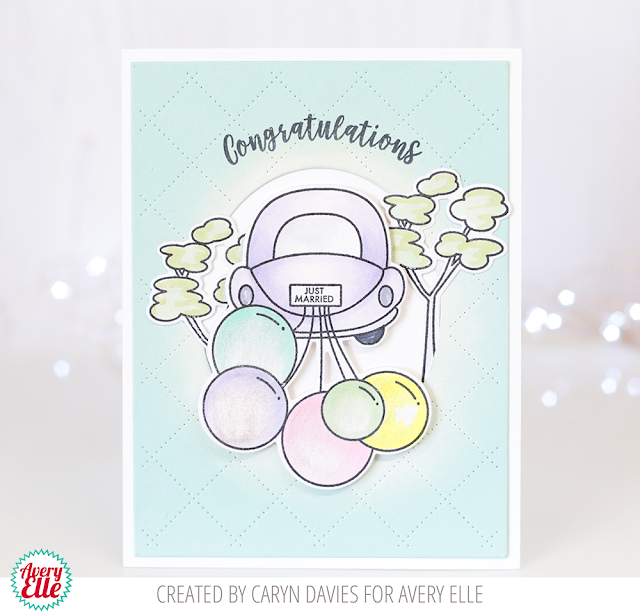 I started by stamping the tree and car with balloons image from Journey onto light gray card stock and colored in with N0, N1, N2, N3, N4, N5 Copics. I used shades of gray card stock for the background. Now to add a pop of color, I colored the balloons in RAINBOW colors with Copics. 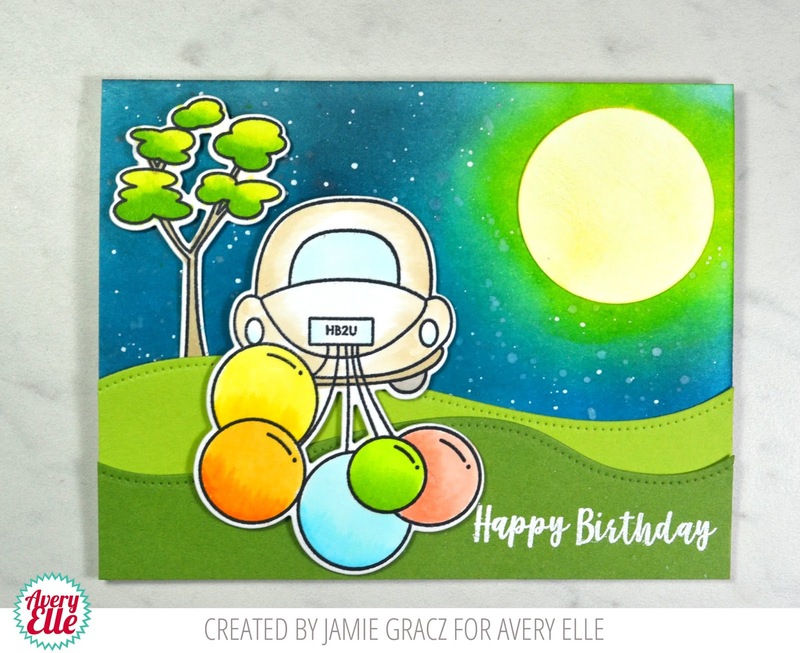 I added the car and tree with foam adhesive to a 4-bar size card for something different too. Often I get in a rut making the same size cards, that making this size was fun for a change. 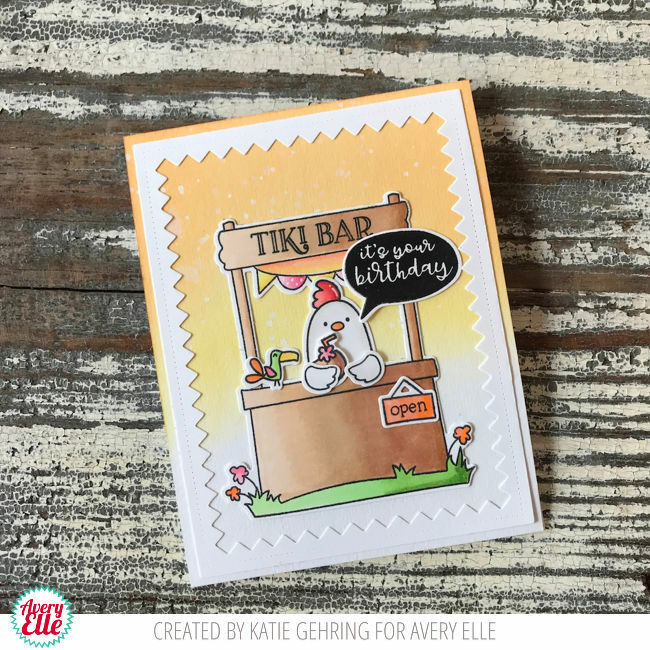 After stamping the Happy Birthday sentiment at the bottom, white details were added to all the images with a white pen. 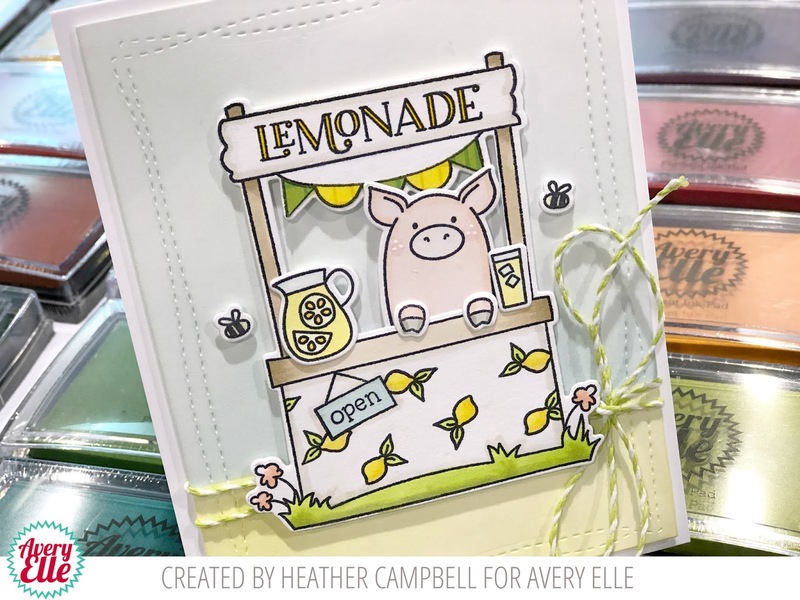 TIP: Don't be afraid to try something new......an all gray card or a new card size! Hello friends this is Nicky with you today and I have a new card to share and hopefully inspire you with. My card today features Journey from the most recent release and it has coordinating Elle-ments. My card also uses the pretty Confetti Mat Die. I started by ink blending two A2 panels of white cardstock so that they matched (loosely speaking)! I used Distress Oxides in Crushed Olive and Spun Sugar. 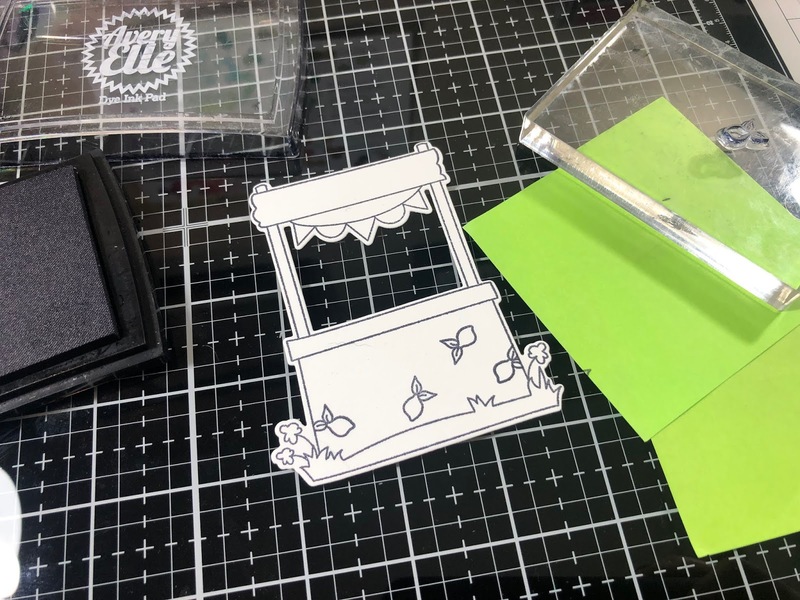 One panel was already die cut with a basic stitched edge but with the other one I used the Confetti Matt Die but instead of cutting with it, I embossed with it in my Cuttlebug. 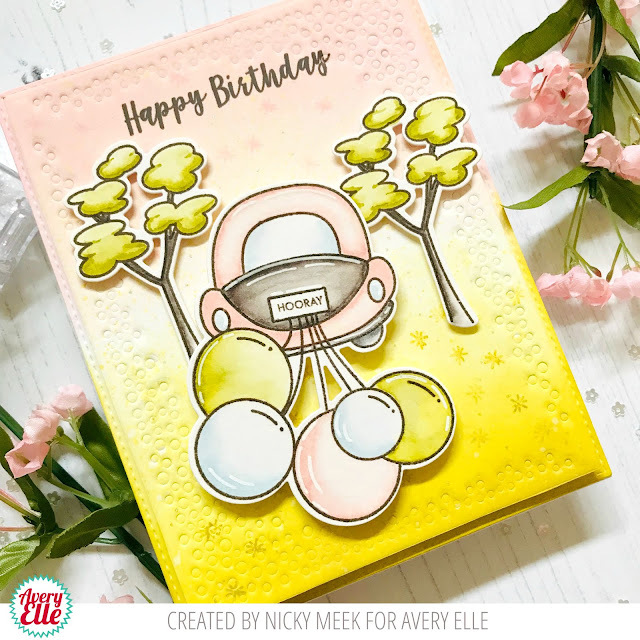 That same top panel was then stamped with the sentiment of 'Happy Birthday' and I also used one of the mini floral images from the stamp set and switched between my green and pink inks and did 1st, 2nd and even 3rd generation stamps throughout the scene just to build an interesting background. I backed this top panel with a layer of white craft foam and adhered it to the other panel and this whole piece was then adhered to a 110lb white cardstock base which is very sturdy for such a dimensional card. On Bristol Smooth cardstock I stamped my images from Journey using Ranger Archival Ink in Potting Soil. I also picked one of the tiny sentiment images intended for the licence plate and stamped that too. I watercolour painted my images using the following limited colour palette of Kuretake Zigs - Mid Green 046, Pale Pink 028, Mid Gray 096 and Haze Blue 302. I then die cut my images and adhered them with two different thicknesses of foam tape. The finishing touches were to highlight one or two areas with a Uni-ball Signo white gel pen and I also dotted in some pale gold dots using a Sakura Jelly Roll pen which gives the card an exciting twinkle when it is handled in the light. Thanks for coming along to read today and I hope to see you next time I'm back with a card for Avery Elle!